Something to Muse About: Marvel's Daredevil on Netflix finally has a teaser trailer! Marvel's Daredevil on Netflix finally has a teaser trailer! Are you ready to wash the atrocity of Ben Affleck as Daredevil from your memory? Well Netflix has released the teaser trailer for season one of MARVEL’S DAREDEVIL. It will premiere with a jam packed, full thirteen (13) one-hour episodes on April 10, 2015 at 12:01 AM PT in all territories where Netflix is available. The show will stream in 4k. After the release of the Atom Exoskeleton from Arrow yesterday, Daredevil's suit looks less than impressive, but the casting is another story. The cast is full of plenty of talented people, and best of all it brings back True Blood's baby vamp, Deborah Ann Woll to the small screen. So what do you think? Will you be tuning in on April 10th? Synopsis: Blinded as a young boy but imbued with extraordinary senses, Matt Murdock (Charlie Cox) fights against injustice by day as a lawyer, and by night as the Super Hero “Daredevil” in modern day Hell's Kitchen, New York City. 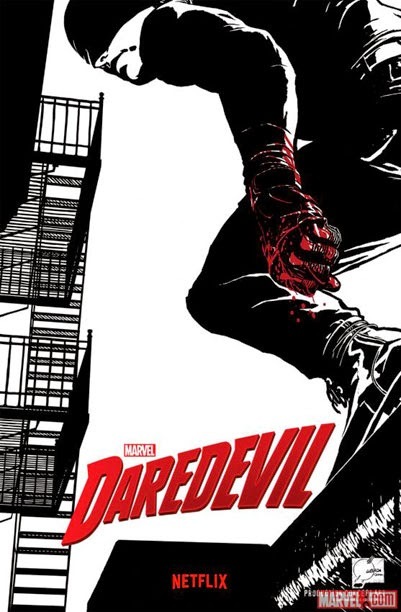 · Season one of MARVEL’S DAREDEVIL will premiere with thirteen (13) one-hour episodes in 4K onApril 10, 2015 at 12:01 AM PT in all territories where Netflix is available. · Synopsis: Blinded as a young boy but imbued with extraordinary senses, Matt Murdock (Charlie Cox) fights against injustice by day as a lawyer, and by night as the Super Hero “Daredevil” in modern day Hell's Kitchen, New York City. · Marvel’s Daredevil is one of the best known properties of the street level heroes and will be the the first of four epic live-action adventure series (Marvel’s A.K.A. Jessica Jones, Marvel’s Iron Fist, and Marvel’s Luke Cage, all leading up to the teaming of the main characters in Marvel’s The Defenders) that delves into the backstory of how Matt Murdock evolves into Daredevil. · Marvel’s first original series on Netflix is Executive Produced by series Showrunner Steven S. DeKnight (“Spartacus”, “Buffy: The Vampire Slayer”, “Angel”) and Drew Goddard ( "Cabin in the Woods," "Lost," "Buffy The Vampire Slayer", in addition to writing the first two episodes of Daredevil), along with Jeph Loeb (“Marvel’s Agents of S.H.I.E.L.D.,” “Smallville,” “Heroes”), who also serves as Marvel’s Head of Television. The series is produced by Marvel Television in association with ABC Studios for Netflix.